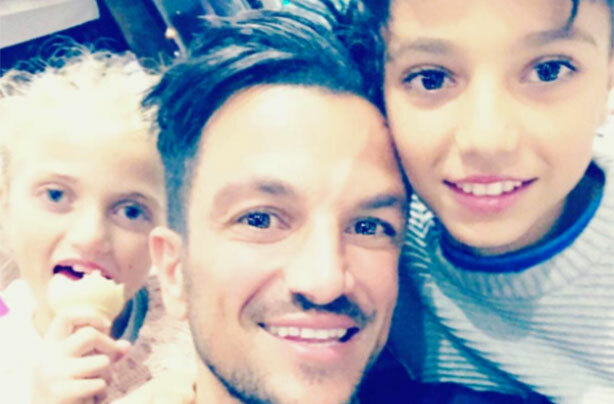 Peter Andre has admitted that the concept of sexting ‘freaks him out’ adding that it’s one of the main reasons he won’t let 10-year-old Princess have a phone. During his guest appearance on Loose Women, Peter talked openly about parenting and social media. He then explained that he gave in and now his son 12-year-old son Junior has a phone. The Mysterious Girl singer also talked about how he’s been in hot water with fans before on social media after taking to Twitter to say he was his kids’ best friend. ‘I like to be their best friend, people criticised me but they just need to get over it,’ he laughed. With that in mind though Peter claims he is very strict with his own kids when it comes to social media. The 44-year-old TV personality is dad to Junior, 12, and 10-year old Princess – with Katie, and his two children with wife Emily – Amelia, two, and baby Theodore. He also admitted that ‘occasionally they “misplace their phone” – it’s fun for a few weeks,’ while hinting with a cheeky smile to the audience that he hides the devices himself. What do you think? Would you let your 10-year-old have a phone? Let us know in the comments box below. FROM: Our sister site, GoodtoKnow. Written by Stephanie Lowe.